“Rescue operations are battling with rising water and are currently bringing in food and medical supplies. The children will be supplied with food that could last at least four months,” Thailand military said. In Nothern Thailand, a day after rescuers found the boys alive inside a flooded cave, the country’s army on Tuesday said the twelve boys and their football coach will have to learn to dive or risk waiting for months for the flooding to recede. “If the children are to be brought out before then, they will have to learn basic diving skills to safely get through the dangerous corridors of muddy, zero-visibility waters as attempts to pump the water levels lower have so far not been successful,” an Army official told BBC. 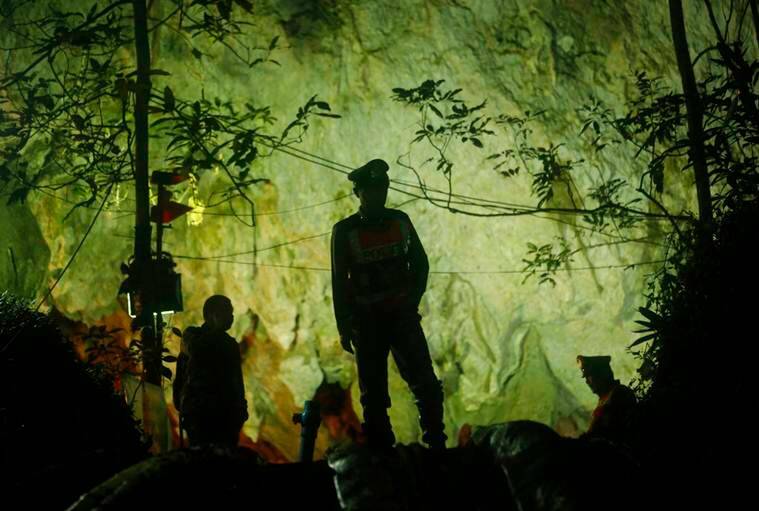 Thai navy divers went into the dark, murky depths of a flooded cave on Sunday (July 1) as the search continued for 12 schoolboys and their soccer coach believed to be trapped since last week. Their rescue brought hope in a desperate search that attracted international help and captivated the Southeast Asian country. “Rescue operations are battling with rising water and are currently bringing in food and medical supplies. The children will be supplied with food that could last at least four months,” BBC quoted Thai military as saying. Rescue divers had spent much of Monday making preparations for a final push to locate the lost soccer players, aged 11 to 16, and their 25-year-old coach. 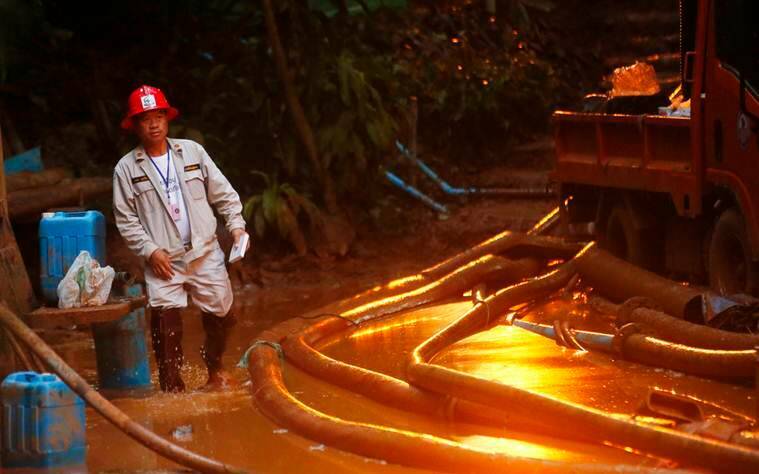 They disappeared when flooding trapped them after entering the Tham Luang Nang Non-cave on June 23. 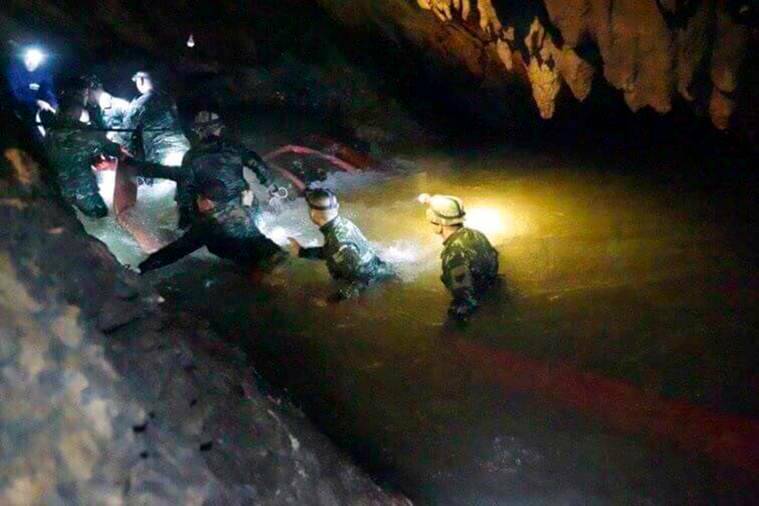 Thai navy SEAL divers and rescue workers from other countries made initial progress through the narrow passageway early Monday after passing through a key chamber on Sunday whose high, murky waters had previously blocked their progress. “We found them safe. But the operation isn’t over,” AP quoted Chiang Rai provincial Gov Narongsak Osatanakorn as saying. Explaining how the rescuers reached there, Narongsak said the passageway the divers made their way through goes upward in some places and downward in others and is extremely narrow, making it difficult for divers with all their gear to fit through. Video released early Tuesday by the Thai navy showed the boys in their soccer uniforms sitting on a dry area inside the cave above the water as a spotlight, apparently from a rescuer, illuminated their faces. Prime Minister Prayuth Chan-Ocha thanked the international experts and rescuers who helped locate the missing for their “tremendous efforts”. “The Royal Thai Government and the Thai people are grateful for this support and cooperation, and we all wish the team a safe and speedy recovery,” Prayuth’s office said in a statement. I just like the information you actually give inside your reports. Let me search for ones web site along with check out again right here on a regular basis. I am just somewhat positive I’m going to master lots of brand new products correct below! Enjoy for the! I just like the information you actually give inside your reports. Let me search for ones web site along with check out again right here on a regular basis. I am just somewhat positive I’m going to master lots of brand new products correct below! Enjoy for the!